There are now over 200 New Dawn graduates. Many are now graduating from Universities and are beginning their careers. Meet some of them below and see how they are beginning to change their world. The first stop for the US team visiting New Dawn this year was Nairobi where we held an Alumni Banquet. New Dawn graduates travelled many miles to be part of the celebration this year. Hear their introductions and greetings and a small sampling of what God is accomplishing in their lives. There are now many New Dawn alumni who have graduated from a University and are beginning their careers. They are already influencing their society for good. "You don't need to be great to start, but you can to start to be great"
New Dawn Orphan, University Graduate, and future Mechanical Engineer. John Gitua Wangui joined New Dawn Communities high school for orphans in Kenya in 2006, He was one of its first students. John had completed primary school but had no hope for going on with his education because of the cost. John recalls "It was by the grace of God that I met Pastor James who helped me to join New Dawn". At New Dawn John worked hard for four years and succeeded in graduating and receiving the test scores needed to go on to a University with government assistance. 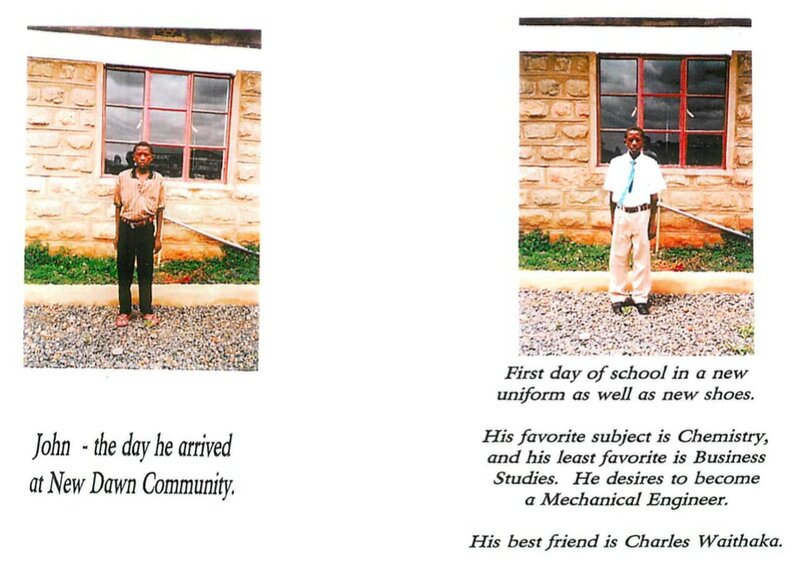 He attended Maseno University, has now graduated, and is working at a security company while saving to complete his Master's Degree in Mechanical Engineering. In a visit to New Dawn in 2014, John told the New Dawn senior class that "You don't have to be great to start, but you can start to be great." and "through New Dawn we were made to understand even our dreams better" and that the current students "can really do better" and are equally capable of succeeding. John said in a recent note "I am planning and hoping that one day I will also join you in assisting other needy students like me". Information about John Gitua as he joined New Dawn. See John address the New Dawn class of 2014 in this impromptu visit above.. The class was building their legacy project (a chicken coup) when John dropped by to say hello and encourage them. If you are a New Dawn graduate, please fill out the form below and you will be invited to our password protected Alumni-only page where you can share with one another. We want to keep track of you and your progress and to share your success stories. Are you a New Dawn graduate? Please register below! Thank you!